Every coffee imaginable? Check. Latte art? Check, check. Great work tables, plenty of electrical outlets, bright lighting, air-con, delicious salads, the smell of ground coffee beans wafting through the air and WiFi. Yes to all of the above. 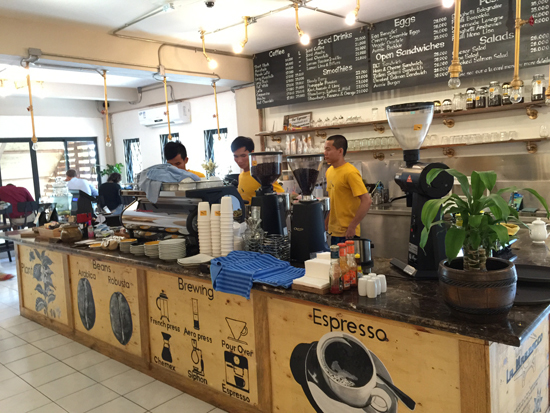 No wonder Naked Espresso has a cult following in Vientiane. 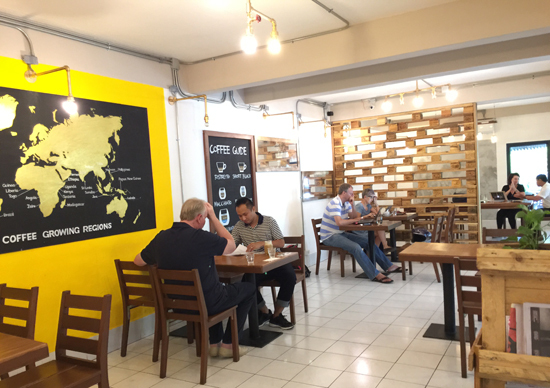 This cafe, with two locations in town, is the place to meet up, do business, collaborate, write blog posts, get your caffeine fix and gobble down some fresh, tasty food. Naked Espresso uses high quality coffee beans grown in Laos. 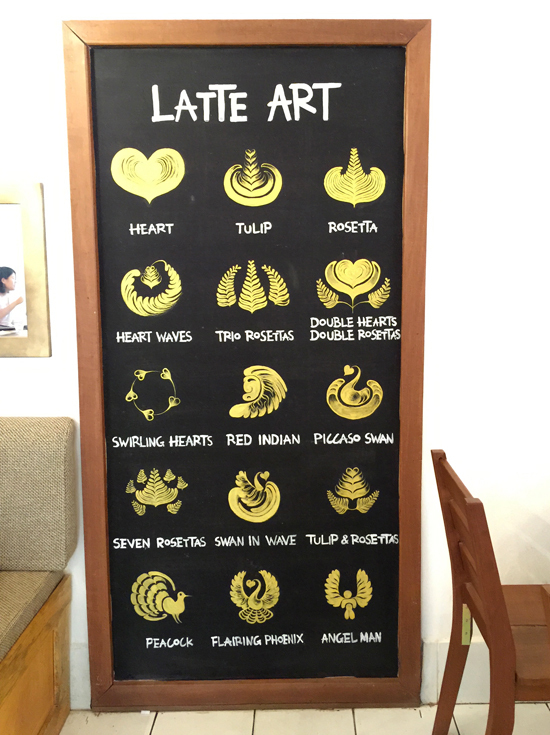 For coffee connoisseurs, you can get your java any way you like, from a plain long black to a piccolo latte with a peacock beautifully etched into the foam. A latte is 17,000 kip, making it competitively priced with the dozens of other cafes in town. Those looking for a non-coffee drink are spoiled with smoothie and fresh pressed juice options, though at 25,000 kip for a small glass, it is a splurge. Road-weary travellers can indulge in fresh food. The menu has a small selection but all the dishes hit the spot and are done well with quality ingredients: eggs Benedict, creamy scrambled eggs or omelette (28,000 kip), hearty open-faced sandwiches (28,000 kip), pastas (35,000 kip), and salads such as a smoked salmon with lettuce, avocado, tomatoes and capers (28,000 kip). The space is bright, open concept, with tables that are just the right height for tapping away on your laptop. They also have a narrow table running along the window with high stools, a large table for groups and a sheltered outdoor patio out front. The prompt and friendly service is icing on the cake. The downtown location is their second cafe and is referred to as Naked Espresso 2. 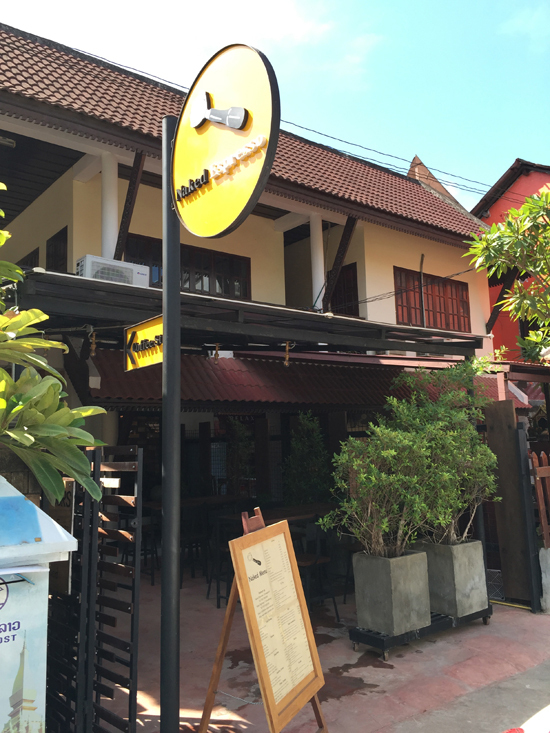 It’s located at the southern end of Manthatourath Street, close to Quai Fa Ngum (night market/Mekong River road). Open Monday to Friday, 07:00 to 17:00, weekends 08:00 to 17:00. 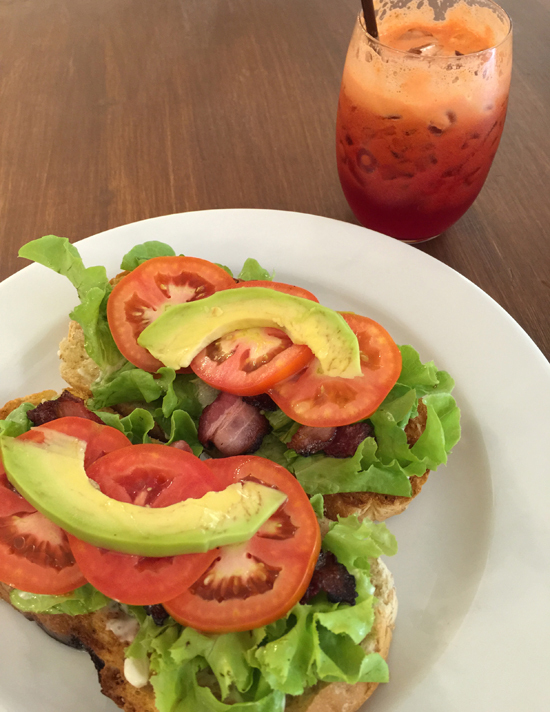 The flagship cafe is located on Dongpalane Rd, 700 metres from the COPE Visitor Centre.